What happened in one school year? It does not matter that 2/3 of the student population speaks Spanish in their home. It does not matter their reading capability could be on a 4th grade level. It does not matter homework never gets turned in and parent phone calls bring little results. What does matter was that my students were required to develop a yearlong research project by stating a problem, thinking of a solution, designing the experimental set up, collecting the required data, and formulating a conclusion. Some of the projects were good enough to enter into the regional science fair. From a selection of thirty-five projects, twenty-four were sent to the regional science fair. Some of these projects won ribbons and a chance to go to the state science fair competition. Five of my students were invited to participate in the elite Broadcom Master Science Competition. No other 8th grader in my school district achieved this accomplishment. Other yearlong projects involved entering the Future City Competition sponsored by the IEEE. My eighth graders had seven teams to compete and three came back with special awards. Another science competition for secondary students is eCybermission sponsored by the NSTA and the U.S. Army. My only team of girls who competed in this program won first place for the entire southern region of the eCybermission Competition. Did any of my students get a thank you or congratulations from our school principal or the district about their science achievements? Sadly, the answer is a no. All I got was a call into the principal’s office at the end of the school year for the purpose of being pulled from teaching the 8th grade for the next school year due to my high failure rate on the state test. My students and I did receive two thank you letters from two community partnerships. The Potters Water Action Group, represented by Richard Wukich and Steve Carpenter were thankful for our educational brochure that my students helped design for their water filtration project. Krista Dunham, Project Director of Special Olympics in Fort Worth, sent a thank you to my students for donating the soap box derby race money that my students organized and who built three scrap box cars for this worthy affair. I am now being monitored on a weekly basis within my 6th grade classes and their posted grades. I am required to have a 15% failure rate. All assignments must be pulled from the district’s online teaching schedule; therefore, no soap box races or water brochures this year. I am not allowed to take any of my students off campus for data collecting. Student project development does not flow well in the district school calendar, so I am being questioned by the principal about my scientific teaching philosophy. Action science with real world data is not on the district’s curriculum website. It does not matter that I have a Ph.D. in curriculum development. I must teach to the test since every three weeks all students will be taking a mandated district test. This means all teachers must review for the test, students take the test, and then we go over the test. That is three days out of fifteen teaching days dedicated to a test every three weeks. Testing and retesting with documented lesson plans from the scheduled curriculum is what the district wants, but is it what the students need really to enjoy science? Our test scores are posted online and evaluated by the administration. Our performance on these tests weighs heavily into our yearly professional evaluation. I have been placed on a “growth plan” due to the fact that I teach what my students should know rather than what the district has posted. I am somewhat a rebel or just set in my ways; however, this growth plan gives the new principal her leverage to remove me from this school. If I do not meet her standards on the growth plan at the end of the year, then I must be relocated to another school. I teach my students math skills, writing skills, and research skills. I document this growth instead of monitoring their district test scores. I have been ordered to submit weekly announcements to the parent newsletter, but my submissions are deleted by the principal. I have been ordered to attend professional development at the level three tier within our district, but there is no level three offered because level three does not exist. I have been documented that 100% of my students do not understand my lessons when I teach because I use “big” words. The 100% came from asking two or three students in the classroom by the principal when she did her bimonthly walk throughs. I have been pulled out of teaching class to be reprimanded on my poor teaching practices rather than wait for my planning time. I must lower my standards and give less work if I am to maintain a 15% failure rate. Is this what the parents want? Will this prepare the students for high school? I can no longer incorporate the arts within my assignments since my activities do not come from the district’s website. The current push for STEM should be the banner to wave inside my classroom since I have been a secondary science teacher for the past thirty years; however, I could not and we should not trade the arts and music for pure technical science and math course work. Creative problem solving with visual displays or performing arts can be demonstrated instead of just technology and engineering skills. Language arts would implement the importance of writing and research instead of just writing a basic lab report. When a student is allowed to decide on what he/she would like to study for their research project so many necessary skills are required. The student must speak and “sell” their project by presenting to outside judges at the regional science fair, designing skills are needed for the backboard, mathematical and technological skills are used for the data collection. The actual meaning of “science” comes from the Latin verb, scire, “to know” via knowledge gained by a study or a particular branch of study (Ayto, 1990). To know encompasses all topics of interest and that is why I teach science bringing in all areas of skills and interests for the student to develop. This is not found on the district curriculum website. I want the student to be creative, to write, to sing, to explore, to draw, to decipher, and to act in order to gain “knowledge” through the sciences. I firmly believe students should have a choice in their own curriculum of study, final assessment should come from a variety of skills displaying the student’s individual growth, and what is taught inside the classroom should be applied to help the local community and school partnerships. My principal has cut my fifteen year commitment with community partnerships for the Fort Worth Botanic Gardens, Botanical Research Institute of Texas, and the Fort Worth Science & History Museum by not approving any of my bus requests. Action science does not exist. Science education lies only in the classroom and on the district’s website. This is the educational delusion I must work in; a science classroom that is data driven to the point of paralysis and where students no longer experience real world problem solving projects. Retirement is my ticket out of this madness, but what will be the student’s ticket out? Spoiler alert: Its money. And ownership …of our children, our schools, and our democracy. There’s a lot of critical critiques of Common Core pertaining to the content itself. Examples of ridiculous math samples and interpretations of social studies hidden curriculum abound on Facebook and blogs. I have no intention to dispute the opinions of people who find the content questionable, even if I don’t always agree. I am not offended by words like “equity” and “diversity” in the new standards, nor are my children personally struggling with the new math methods. But I oppose CCSS vehemently nevertheless. Liking or disliking particular standards, language, or strategies is not a solid ground on which we can create a unified front to fight Common Core. I know many highly qualified good teachers and parents who like some of the standards. I know other highly qualified good teachers and parents who hate them. These are not stupid or uninformed people either. The collective experience with the standards themselves vary from child to child, teacher to teacher, grade level to grade level, and district to district. We will never arrive at consensus on their overall “quality.” For some schools, some of the standards might be better. For many school, they are far worse. You will confront many parents and teachers who will say to you, “But this is great for my class- or my child!” How can we respond to this without invalidating anyone’s personal experience? We cannot simply say, “No you don’t. You’re just being naïve.” We must appeal to fact, not opinion. We could debate this for decades and get nowhere trying to convince others to see what we see. And therefore it will be difficult to build solidarity of opposition using this tactic. What matters to me, and what I believe to be the obvious and indesputable way to dispute the Common Core standards is by illustrating who it is that stands to really GAIN from their implementation. And what they will really cost the rest of us. Let’s revisit who wrote the standards: Of the 30 or so people who wrote the standards they largely all hail from major non-profits or testing companies: ACT, College Board, Students Achievement Partners and Achieve. For more detail see Mercedes Scheinder blog. This makes sense when you look back at who created and continues to promote their implementation. 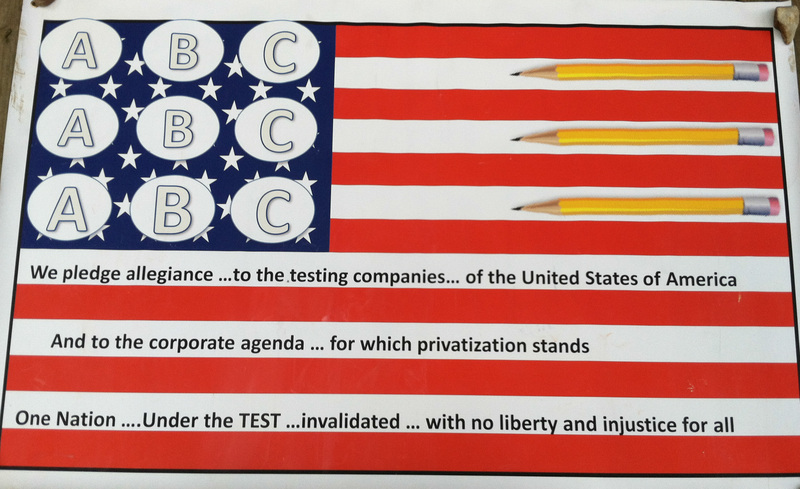 The same testing companies and non-profits: College Board, ACT, Achieve, Pearson, Student Achievement Partners and more. Billionaire corporations notably Bill Gates, Eli Broad, and the Walton Foundation, and other corporate members of the American Legislative Exchange Council (ALEC) have been devising a corporate takeover of public education for decades. Se the entire Who’s Who on this chart. 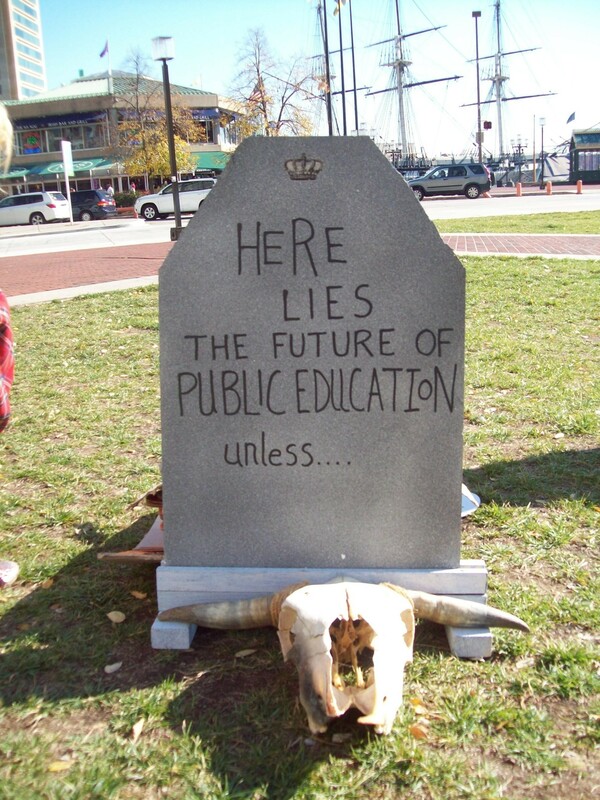 According to a paper from Fordham Institute, called How Will the Common Core Impact the Testing Industry, the motivation to create creation of the PARCC and SBAC consortia is that they eliminate the need for every state to “create its own tests and thus cut down on the production costs” that are aligned to the Common Core. Further, online and education technology companies have had significant influence in shaping education policy over the last decade. Why? Because Common Core materials, instruction, tutorials for teachers, and assessments can be delivered online, thus creating a boon of profits to these companies to sell us, manage, and assess the goods. The profits to these companies ca be seen here on this chart. Of course, the multiple interests in gathering students’ private data goes hand in hand with the interests of private companies who via online education can chart, track and “mine” volumes of private information from our children. This video from Knewton (a private education technology company that partners with Pearson) says it all. So while profits to testing and textbook companies sky rocket, the expenses to states and districts to implement new testing and curricular policies will bankrupt schools and communities. When the “coupon” to buy Pearson products foisted upon states called Race to the Top funding runs out, who will continue to pay for these more costly and ineffective standards and assessments? We will pay with our tax dollars, our children’s future, and our democracy. These facts are not a matter of interpretation. Simplest way to stop this? And share these facts with your schools and communities. The costs to our pocket books, to the future of our pubic schools, to the quality of instruction for our children, and to the loss of privacy and protection of our children from the grips of corporate vampires is something upon which we can all agree. It’s ample reason to end the madness. No debate required.